You have heard all about how herbs can save you money when you cook, but did you know that herbs can save you in other rooms besides the kitchen? They sure can! There are so many uses for herbs that you may be surprised to learn! Herbs and herb gardens are not only great for providing kitchen herbs, for helping your family bond, and for providing visual appeal to your home and landscape, but there is even more these little plants can do that will knock your socks off. Below, you will find 7 simple and surprising uses for herbs. You might just be shocked at what other benefits they can offer that not only save you time but money as well. Have you planted your little herb garden yet? If not, read these 7 simple and surprising uses for herbs and you will surely be motivated to. In fact, you will wonder how you ever did without one. Take a look! Add a little crushed rosemary to one squeezed lemon and a cup of water. Shake well. You can now apply it to skin or clothing for extra bug protection. No more harmful chemicals, and it smells lovely! If making ice tea, fruit smoothie, lemonade, or other summer beverages, you can easily add some extra flavor and visual appeal when you use herbs. Stir some mint leaves into your beverages or add it to your ice cubes before freezing. It adds a pop of color and flavor. Many people are starting to infuse basil into their beverages as well as it add an interesting layer of flavor. Have fun experimenting and trying different herbs in your beverages. 3. Make your own soaps. You can buy simple glycerin soap kits at your local craft store. When preparing your mixture, add some chopped herbs such as rosemary, mint, lemon balm, and more to the mixture. They will add aromatic and in some cases healing properties to your soap for sure. Mint can rejuvenate your skin while rosemary tones and refreshes. Plus, it adds a pop of color to the glycerin as well. Double bonus. 4. Incorporate into floral arrangements. Why not add a few sprigs of fresh herbs to your floral arrangements? Many herbs such as basil bloom beautiful white flowers and smell wonderful. They look and smell lovely tucked into a summer bouquet, plus the recipient can use them when the other flowers wilt! Pretty and purposeful. Dry and crumble your herbs and put them in a simply stitched fabric pillow. Just cut scraps 3 by 3 inches square, sew edges closed leaving a small space to pour in dry herbs, then stitch shut. An ideal herb to use is lemon balm or lavender. Then, just toss your sachet in when you dry clothes and the scent is released. Don’t spend money on dryer sheets full of perfume. Instead, make your own dryer sachet! 6. Use for health benefits. Did you know that parsley can cure upset tummy? And that lavender soothes headaches? Keep these herbs on hand so when an ailment hits you are ready. You can infuse these herbs into a tea, or the parsley you can even eat fresh. Lavender can be placed into a microwave safe fabric and heated for instant and soothing relief. Some women love soaking parsley in warm water then applying them to treat under eye circles. 7. Dress up your bath. You can crumble herbs directly into your bath water for a soothing experience. Not only will they give off a lovely scent, but many have healing properties too. Just pick and crumble your herbs and drop directly into your water. Or, you can place a bundle in a mesh bag and drop in if you are worried about clogging up your drain. Ideal herbs for this are mint, lemon balm, rosemary, basil, and lavender of course. Enjoy a spa experience for less when you add herbs to your bath time routine. You can even keep a small herb plant right in your bathroom. Then, you can just pluck and go! See what a cinch it to find uses for herbs in other ways around your home? Who knew they could find a place in you bathroom, bedroom, and even medicine cabinet? Herbs hold a variety of powers such waiting to be discovered. And now, you know 7 of these uses that you can try right away! If you used to think that herbs were only good for salads, think again. Using herbs in these various methods can enrich your life and stretch your budget. Now that is a plant worth growing! 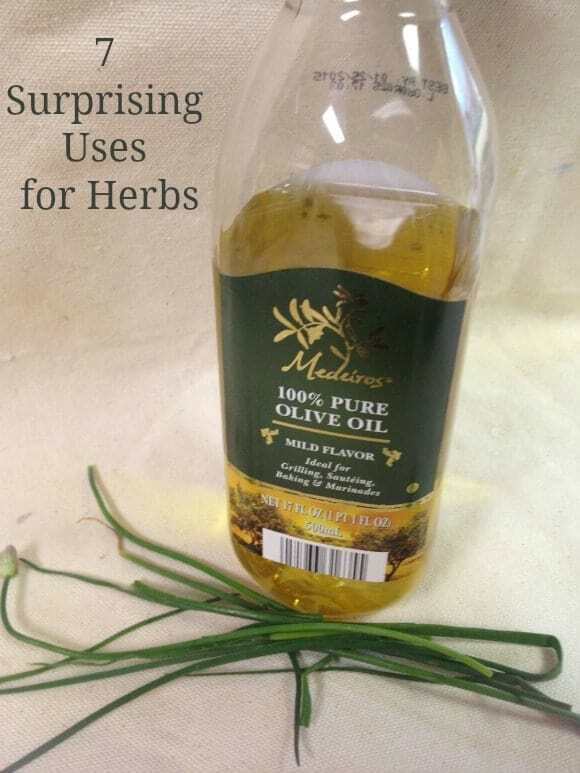 Do you know of any simple or surprising uses for herbs that wasn’t featured above? We’d love to hear about it! I am definitely going to try the natural insect repellent. Thanks! I *knew* each of these, yet I’ve never actually done them. Why is that? I think I’ll start with the repellant, the mosquitos are so bad here right now. Thanks for the reminder to get on it! Love these, esp the one insect repellent one! How neat thanks for sharing those! I would have never thought to make my own soap or use to garnish a drink!! Most of all a dry satchel sounds so neat to do!! I do have some herbs, but I never would have thought of those uses for them! Great idea! Especially the bug repellant.